The debate over the sale of EMMC dialysis patients to Davita is not a Union vs EMMC issue, as some choose to say. It is a Patient Safety issue. Patient safety is an issue for every single Maine resident who uses our healthcare systems. This Davita issue is also about relinquishing local control and governance over the quality and safety of care provided to local Maine patients. Unforeseen illness, injury or medication complications could put any one of us in a dialysis chair some day. This should frighten every single one of us. I asked for a tour of the EMMC (BOYD) dialysis services the other day. The clinic supervisor seated me in the waiting room for about 10 minutes while he made the necessary calls to EMMC bosses to address my request. That gave me the opportunity to talk with the spouses of 3 local dialysis patients. They were uncertain and fearful of Davita coming to Bangor. One dedicated husband said he wished he had known about the hearing because he would have attended. It’s a shame they didn’t know. Patients and families would have benefited more than anyone from the DHHS Certificate of Need hearing. It seems that EMMC staff should have posted the hearing information in a dominant spot for all to see…especially patients and their families. Sadly, the patient’s voice is left out of decisions that are most important to them. I was denied a tour of the facility. Apparently, my concern for the safety of EMMC dialysis patients was not a good enough reason to be allowed to see it. Before I left, I had a brief conversation with the clinic supervisor. He said he had done research on Davita. I asked if he had read about how Davita has sued doctors because they resigned and left to work elsewhere because they believed Davita policies were not safe for patients. They bucked Davita policies. Yes, the young supervisor had read about that. “How did that make you feel?” I asked. He said with a very non expressive face “indifferent”. Wow. I didn’t have anything else to discuss with this man. His indifference over something this damning of Davita was alarming. He was responsible for every patient who was hidden behind those securely locked EMMC clinic doors. Even though his response floored me, I realize that EMMC and Davita have wedged him into the middle of a situation that he has absolutely no control over. If Davita comes, he and every other person, including doctors on staff at our dialysis clinics had better get use to not having control over anything in the “business” of Davita. I am extremely concerned for EMMC dialysis patients if this financial deal goes through. At the July 10 Certificate of Need hearing, I displayed 3 posters. Two of them had the real life stories of 5 patients from Davita clinics from across the US. The patient heroes (whose photos and stories were displayed) wrote their own testimonials about personal harm from their Davita clinics. Most of them had been dismissed from their clinics, simply because they were vocal about their concerns and harm. These 5 people were just a tiny sample of thousands of patients who have experienced the exact same thing. I didn’t observe one single Davita rep, EMMC manager or dialysis staff person reading those stories, even after repeated welcomes to all to do so. Could it be that they don’t care about patient harm? Dr Razcek, EMMC vice CMO described the patients’ experiences as anecdotal. It’s odd that he would describe the stories of real life dialysis patients anecdotal, but swallow the stories or “so called” evidence of Davita whole. Dr R’s comment was insulting to the integrity of those 5 people who have suffered through harm, retaliation, segregation, bullying, physical and mental abuse, and now someone is questioning their honesty? I have spoken with each and every one of those patients and they are real, their suffering is real and their stories are real. I offered to put EMMC leaders in touch with those patients and that offer was refused. These patients’ stories are the absolute and dangerous truth about Davita. “The right care, at the right time, in the right place” was in bold print in the half page EMHS ad in today’s BDN. . Apparently, that promise is made to everyone except dialysis patients. EMMC/EMHS will have no control over Davita policies or the quality of care that our Maine citizens receive in Davita managed dialysis clinics. There will be no local governance. Davita skewered the EMMC dialysis care outcome reports during the public hearing. If I had been an EMMC manager, that would have made me very angry. In fact, although I am no longer employed by EMMC, I do remain loyal, and it made ME angry. My family and I receive some of our healthcare services from EMHS and EMMC. Who validated Davita’s data? Davita did. Conspicuously missing were Davita’s records of dismissals and patient harm. Records of their care outcomes, patient safety measures, and regulatory violations in California are available online. 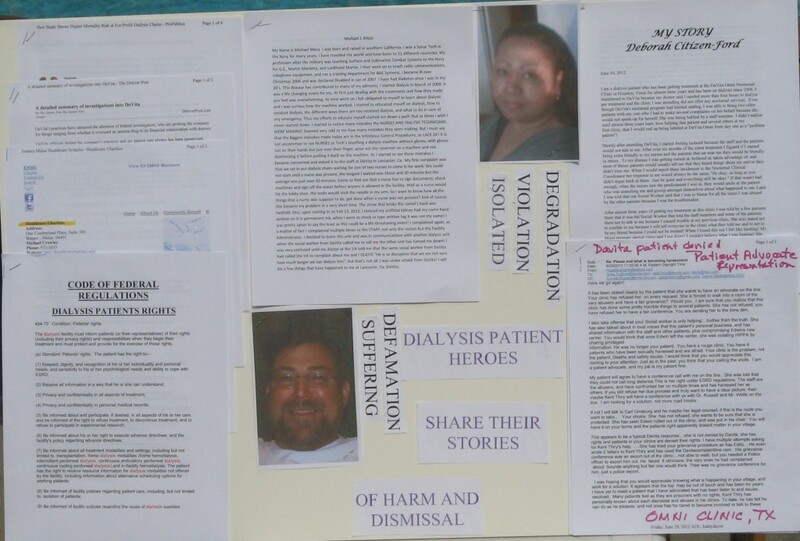 The 5 patient stories I displayed were just a sample of many who have been harmed and dismissed by Davita. As a Mainer, a retired nurse and as a former employee of EMMC, I was insulted by Davita leaders and their condescending presentation. If EMMC continues to pursue this $10,000,000 sale, and dialysis patients are harmed by Davita, EMMC becomes complicit in any resulting harm and sickness that our local dialysis patients my encounter. Keep the control and funds for dialysis services in Bangor, ME. Use any revenue to address perceived defects in our local clinics. Keep the dialysis business-related revenue in the local pharmacies, laboratories, and supportive services. Keep the safety of Maine patients in Mainer’s hands. Davita cannot do one single thing better than EMMC except make money and pay stockholders. 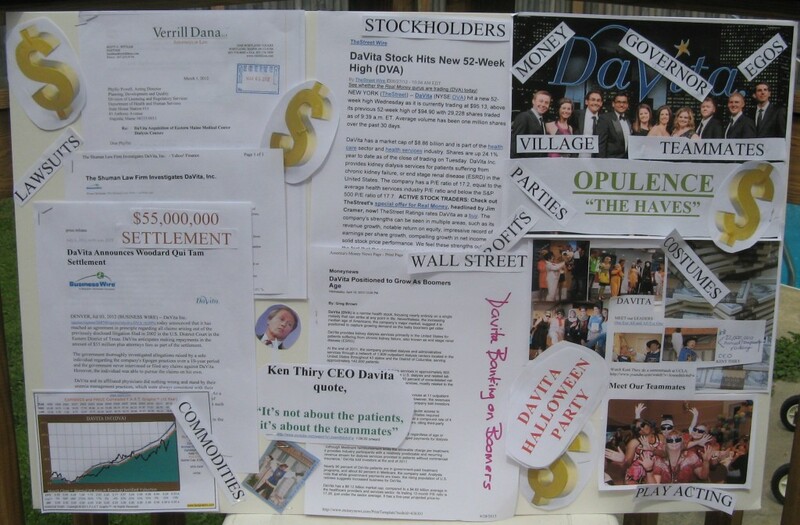 My third display poster for the hearing , showed photos of the CEO of Davita in a Three Musketeer Costume and quotes from him saying “It is not about the patients, it is about the teammates”. These photos, quotes and articles are available to anyone online. This poster should have made it perfectly clear that money intended for high quality dialysis care is siphoed off by Davita and goes to glitzy rich booze soaked parties, huge new $100,000,000 Denver, CO headquarters, a $22,000,000 annually compensated CEO, and most importantly to them, into stockholders hands. Davita is even banking on boomers! I posted that article on this board as well. Mainers, demand that the control of our local dialysis clinics stay in local hands. Cheapened care, cookie cutter treatments, and Walmartesque services from Davita will not benefit Maine dialysis patients. The State of Vermont rejected Fresenius (Davita’s biggest competitor) because citizens declared that For profit dialysis services were not for the public good of Vermonters. Davita services are not for the public good of Mainers. Categories: Uncategorized	Tags: Bangor, Certificate of Need, Davita, Dialyisis patient dismissal, Dialysis, Dialysis patient stories, Eastern Maine Medical Center, for profit dialysis, Fresenius, Kathy Day RN, Maine, Maine Department of Health and Human Services, Maine State Nurses Association, patient harm, PATIENT SAFETY.